Help your students remember the details of each book by starting every lesson with a review. 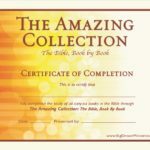 Download the Review Guides for each set which include summaries, an easy-to-read review and class guide on each book of the Bible, and a fun written quiz or review activity for each lesson. Choose from PDF version or two picture styles.